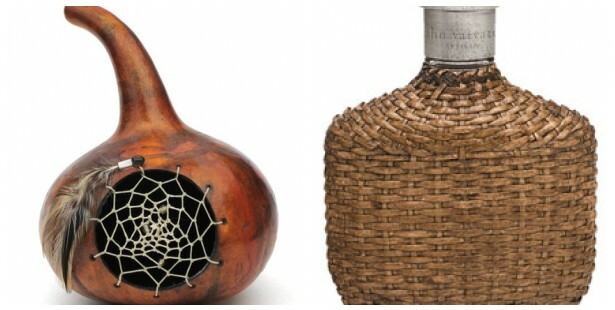 This is one of those few times where I couldn't care less what the scent is like—just let me give that gorgeous rattan enveloped bottle! John Varvatos' Artisan por homme, $75.00 is described as—a fresh blend of oranges, herbaceous thyme and lavender with base notes of kephalis and other woods—although all I can think is rum runner and how much the scent reminds me of MD Skincare's Botanical Bar with Tea Tree & Aloe. It's rather linear in its orangeness and totally unisex. Right now you can purchase it through the John Varvatos Fragrance website but it should be in Saks and is on Amazon. To go with Artisans rustic sensibilities, just look at this incredible Dream Catcher piece by Art By Shawna, $75.00. Each one of Shawna's gourds are absolutely breath taking and would make a treasured keepsake for sure. For more be sure to visit her artists website.